After boarding the Dewees Island Ferry, life decelerates to a pleasant, sea-breezy pace. 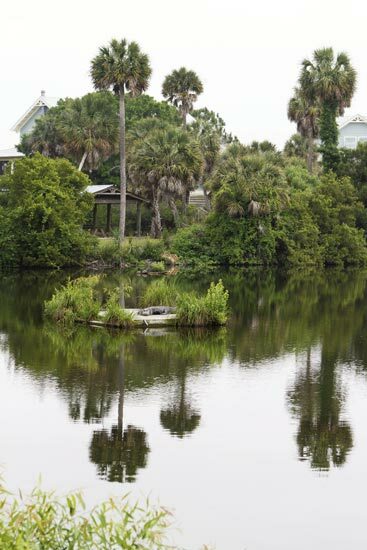 The ferry dock and Island Center is also home to the Nature Center, a reverse-osmosis water station, and plenty of golf-cart parking. 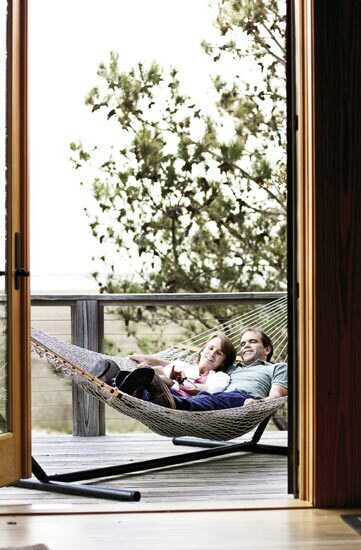 Of course, you can also ditch the carts and all cares and simply park in a hammock, savoring the serene marsh vistas. 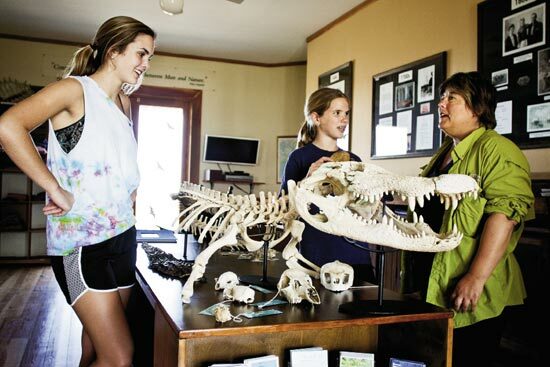 Sally (left) and Claire (middle) make a pit stop at the Nature Center, featuring a touch-tank, a live turtle exhibition, and info on barrier island ecosystems, including gator orthopedics. A sandy path leads to the island’s northern tip, where clamming adventures, and resulting muddy knees, await. 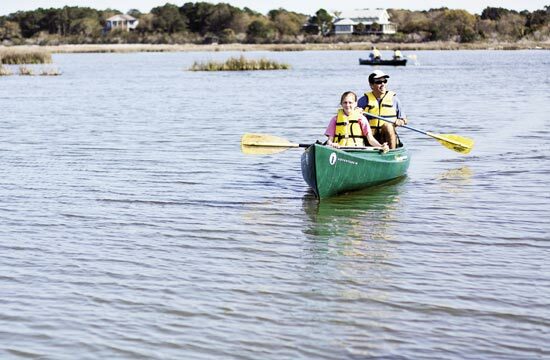 From ocean waves to impoundment paddling, Dewees offers refreshing watery fun. Ever notice that ospreys always carry their prey aerodynamically, with the poor fish’s head facing forward? Me neither. Never paid much attention or gave it much thought, but I learned this little nature nugget within five minutes of disembarking the Dewees Island Ferry. “Ospreys have four talons, not just three, and one is reversible, so they can turn their catch to face forward,” said Judy Fairchild, the island rental manager who greeted us at the dock and oriented us to our accommodations and all things Dewees, which means all things wild and beautiful. “Our raccoons are tidal, not nocturnal, as most people think. 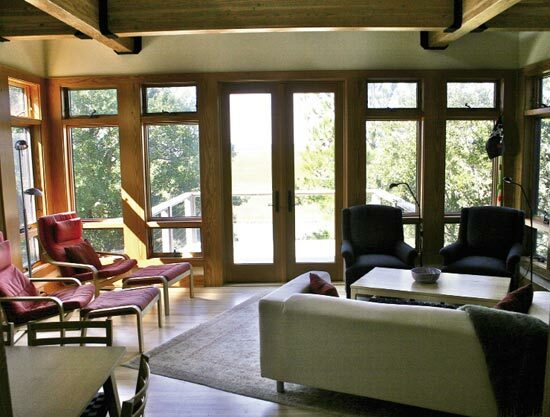 And they’re really quick and savvy, so don’t leave porch doors open or food outside,” was another tidbit she shared as we explored our house’s multiple screened porches and tree-top perches. Turns out that osprey prey transport is but one of many details I don’t typically notice or pay much attention to, and one of many subjects I began to see differently after spending time in this place where things are done decidedly differently. A semi-remote island has a way of changing your frequency, shifting your bandwidth. After a few days of Dewees detox, you begin to tune out of the rigmarole and hyper yap of a blaring world and tune into more subtle, more astonishing things. Like how to identify the high pitch of an eagle call. How incredible it is that the red knot, a shorebird with one of the longest migratory flights, feeds almost exclusively on tiny horseshoe crab eggs. How gloriously inert a gator can be. How pleasant and sane it is to walk or bike sandy paths and not have to turn a car ignition for days on end. How deliciously decadent fresh clams (garnished with cream and whiskey!) are. And perhaps most astonishing of all, how you can feel so far away, so distanced from daily life, only a few miles from home. Dewees Island—the barrier island just north of Isle of Palms—is only nine miles, as the osprey flies, from my Mount Pleasant home. It takes me less time to get there than it does to drive to Folly Beach, but instead of fighting traffic and counting stoplights, we ditch the car by the Isle of Palms marina, hop on the ferry, and count dolphins and seagulls. Outside on the ferry’s upper deck, the salty breeze begins to smooth worry lines from my face—it’s a relaxing and radically different way to travel, a different way of being. And in less than 20 minutes we’re on a quiet, pristine island that embraces simplicity, sustainability, and slowing down. 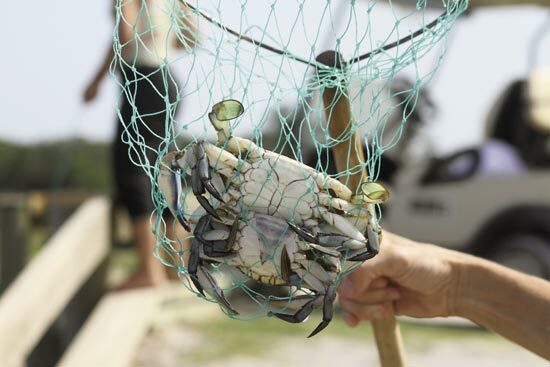 Dewees seems to be one of those Lowcountry insider secrets—it flies under the radar, and contrary to our Twitter-culture imperative for self-promotion, it’s happy not calling attention to itself. Mostly that’s because Dewees is a private island and has been for nearly three centuries. 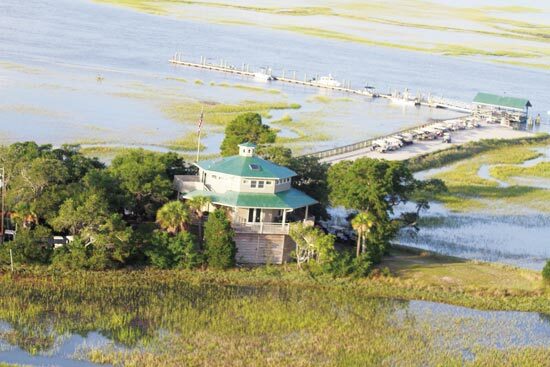 Dewees, or “Timicau” as it was known to Native Americans, was one of the five “Hunting Islands” (including Sullivan’s, IOP, Capers, and Bull) prized by the Sewee nation. 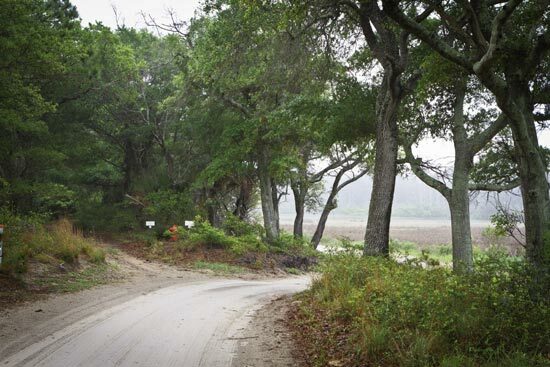 First purchased in 1770 by the son-in-law of John Archdale, governor and lord proprietor of Carolina, Timicau was conveyed circa 1761 to patriot Cornelius Dewees, then over time by a long succession of owners—including the Huyler family, who lived on the island from 1924 to 1956, and the Reynolds Metals Company, which used it as a hunting preserve. 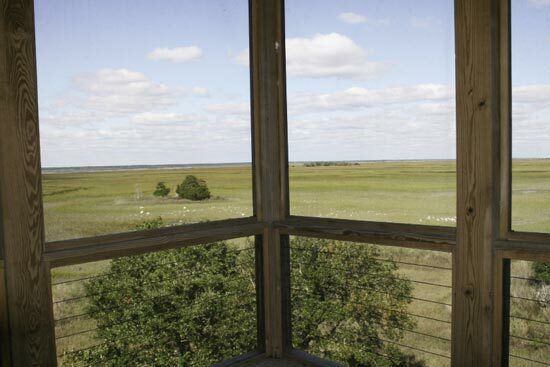 In 1991, a group called Island Preservation Partnership, led by developer and sustainable communities pioneer John Knott, bought Dewees and proposed a new environmentally sensitive development model. 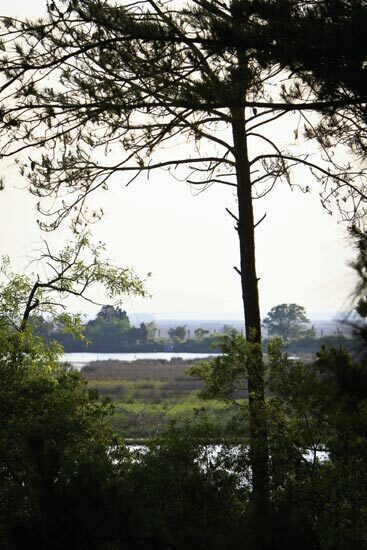 Instead of a strict wildlife refuge (like Capers or Bulls Island), Dewees would welcome homosapiens as a natural part of the natural environment but limit their impact through strict covenants, easements, and sustainability measures governing all lot purchases and construction. 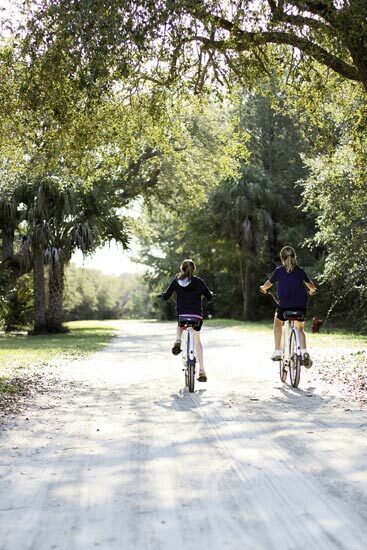 Even when fully built out (currently there are only 63 homes out of the planned 150 lots), 95 percent of Dewees will remain undisturbed. Part of safe-guarding this fragile balance between humans and nature means limiting access to the island. 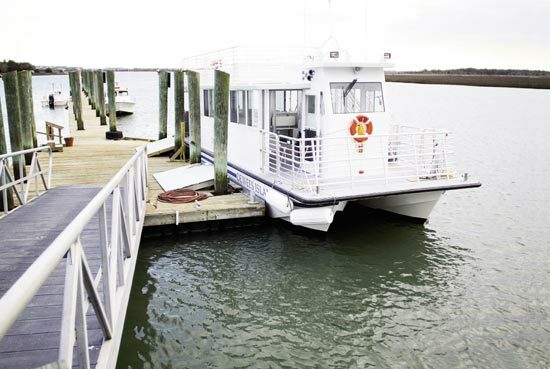 Only property owners, their guests, and renters can use the ferry, and the ferry is the gate-keeper—private or commercial boats (other than those of property owners) cannot dock or anchor offshore as they can at neighboring Capers Island. 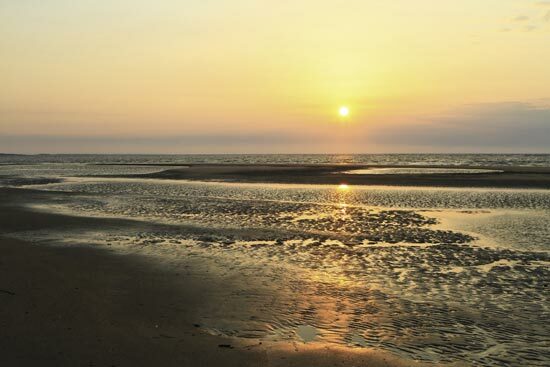 But Dewees does welcome visitors, warmly in fact, making it a perfect weekend getaway, romantic escape, or summer vacation option for locals who’d rather spend their “off” time kicking back than traveling (and pocket huge gas savings!). Actually, Dewees is ideal for anyone who values the rare opportunity to escape traffic, strip malls, and street lights and dial back to basics like starry skies and wide, empty beaches, but still be able to make dinner reservations at FIG. 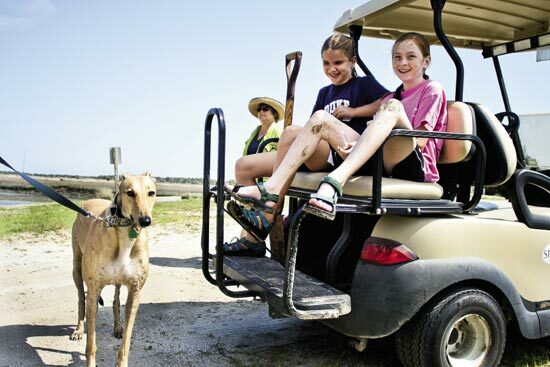 “I can’t wait to ride the ferry, and the golf carts,” said my 11-year-old, Claire, who had been to Dewees once before and knew the delights in store. Claire and her friend Adela had a blast bumping along in the back of the cart as we moseyed down a sandy path, through tunnels of dense and green maritime forest, toward the north end of the island—aka clamming heaven. 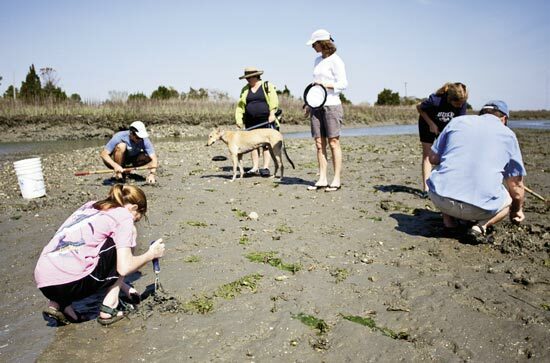 Pluff mud, I now believe, is merely an abstract concept until you’ve gone pluffing through its dense, mushy layers with a clam rake and bare hands, until you hear the damp, mucky sigh and gulp as you open pockets of indigo-colored creek bed to sift for bivalve treasure. The girls dug in and loved it (and were much better at finding clams than I was), and at dinner that night, Claire polished off 14 clams. That’s my girl—eating local! changing vista right out of a Monet painting (with a little Gauguin tropical flourish thrown in). Egrets and herons elegantly pose; gators loll; and my canoers paddled about, ducking in and out of the reeds. Birding, fishing, and shell hunting, especially on the island’s northern end, are all popular pastimes. 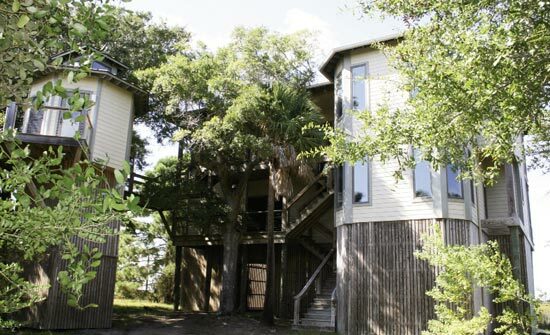 For a family vacation, Dewees feels enticingly remote and slightly exotic, like you’ve landed on a semi-deserted island, but one with a nice swimming pool, tennis courts, and foosball in the game room. Kids can wander and explore to their hearts’ desire, a luxury in today’s world. Adults can let their hair down. There is no pretense here—nothing screams “exclusive” or “private”—it just feels refreshingly low-key and real. Maybe it’s the fact that homes are tucked back into the trees, with no fancy or non-native landscaping; or that a warm sense of community among the property owners and the island’s 14 full-time residents is palpable; or maybe simply that the pace is notched down several mphs to beach cruiser and flip-flop speed. Whatever its particular magic may be, Dewees draws you in and will definitely draw us back. I have my clamming reputation to redeem, after all. “They’re there, you’re just not seeing them,” said island resident Reggie Fairchild, as I had both hands wrist deep in pluff mud, feeling, unsuccessfully, for that small, slightly rounded shell. Yes, that’s exactly what Dewees does, invites you to dig a little deeper, open your eyes and other senses, and find what’s there already that you’re just not seeing. Getting There: The Dewees Island Ferry leaves from the Isle of Palms Marina (you’ll see a sign for it and its parking lot just before the main marina lot). Ferries leave for the island on the hour, and from Dewees to the mainland on the half-hour. Plan for enough time to unload and park your car (about 20 to 30 minutes prior to departure). Your rental agent will make your ferry reservation for you. Ferry fees are $7 per person each way, so pack wisely. It can get pricey going back and forth. What to Bring: There are no stores on Dewees, so plan your meals ahead of time and bring a cooler for transporting perishables. 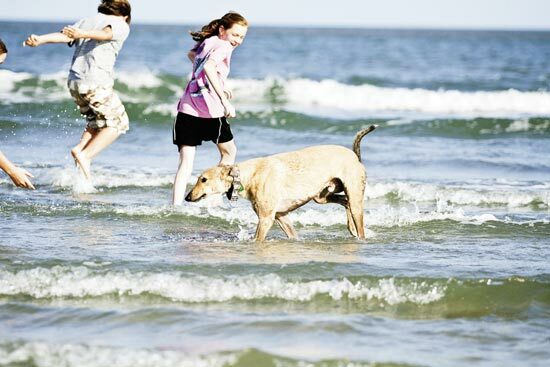 Bug spray and sunscreen are a must, as are good walking shoes and water shoes for clamming, fishing, and more. Beach towels are not provided in most rentals. Visit www.deweesislandblog.com for more info, photographs, and island updates.